How do I choose from all the different systems? The Performance Comparison Table highlights some of the differences among the various options. It is important to keep in mind that there are frequently many different solutions that will result in the same level of user enjoyment and different people can have different opinions of any given system. For folks with very limited budget and/or who may just want to get some bass to compliment a soundbar or bookshelf speakers, a pair of MBM-18 cabs, PA-460 drivers, and a Yung 500 watt plate amp (6dB boost option; one amp can run two subs) will provide a surprisingly amount of bass (approximately 115dB) into the mid-20's Hz. Such a system would blow away the 6.5" - 8.0" woofers-in-a-box that are sometimes marketed as subwoofers. For folks who are looking for movie bass with extension below 20Hz at the best value, MartySubs may be your best bet. Two MartySubs and an NX Series amplifier will provide Reference Level bass output in most rooms. We recommend Mini-Marties as providing the best combination of output and extension for most folks. For larger rooms or for folks who like to run their bass "hot", four subs has proven a very popular choice. If Mini-Marties are too large, go for the Cubes. For the last couple dB of extension (and if size permits), go for Full Marties. For folks who feels that they need a little more mid-bass punch in their systems, MBM-18's with PA460 drivers can be added to any of the MartySub-based systems. For folks who want it all, a quad set of 21-inch HT subs loaded with 21DS115, 21SW152 or SAN214.50 drivers and either a couple NX6000D amps or a SpeakerPower SP8000 leaves little to be desired. Very few subs in the commercial world compare with systems at this level. Those that do tend to have price tags in-line with premium automobiles. There are always some folks who want to be at the ultimate edge of performance. If this is you, stay tuned...we are working on some projects that push the limits of subwoofers about as far as can reasonably be done in a home-sized setting. How much performance can I really expect from MartySubs? Compared to a typical home-theater-in-a-box (HTIB) or even a typical 12” subwoofer powered by a 250 watt amplifier (as you might find in many home theaters today), there is simply no comparison to a MartySub. We could cite performance specifications (such as 120dB+ output from 20Hz up) as being typical of what a MartySub will do in a typical room, and “over Full Reference” output from a pair, but that would be meaningless to many folks. Let’s just put it this way, a pair of MartySubs and the recommended amplification will meet and in many cases exceed (by going lower and playing louder) the movie bass experience that you have come to expect from the "main theater" at your local cineplex. Will a MartySub by GSGTM work with my system? If your receiver has a “subwoofer” RCA output, you are good to go. Despite using professional grade amplifiers, MartySubs by GSGTM are connected to your system in the traditional fashion—a simple “RCA” cable goes from your receiver (or other subwoofer output) to the amplifier’s input. The input on the amplifier uses a professional grade connection called an “XLR”. Therefore to connect your RCA output to the XLR input, you will need an RCA-to-XLR cable. Such cables only cost a few dollars and a link to a cable is provided on the Checklist page. If you are unsure how to connect a MartySub by GSGTM to your system, please contact us at customercare@gsgad.com and we will try to help you figure it out. Do MartySubs by GSGTM come with instructions? Yes! We have put together step-by-step Assembly Instructions that include pictures of how the panels go together as well as several build tips. No complicated tools are required for a MartySub build. I was hoping to use a Speakon connector instead of the terminal cup. What should I do? For many folks, the standard terminal cup with the traditional banana plugs is the easiest to work with. Other folks prefer the Speakon connector. In order to accomodate both groups, we have made the basic cutout for the terminal cup and have included an adapter for folks who want to use an NL4MPR Speakon connector. Just glue the adapter into the terminal cup hole and then attach the Speakon connector to the adapter. Designing it was a bit of an effort, but using it is a piece of cake! The Speakon is even recessed (flush with the back of the cabinet) for a professional look. If you want to use the Speakon adapter, we recommend attaching it before assembling the rest of your cabinet. How do I set up the digital signal processing ("DSP") on my amplifier? IMPORTANT: These settings MUST be applied BEFORE running your subwoofer or it could be damaged. The protective high pass filter should be set at or just below the tuning frequency of the subwoofer or MBM. 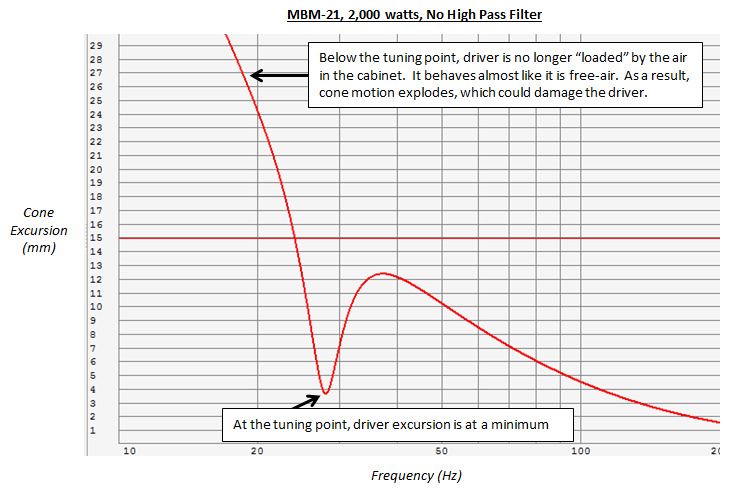 If you are unsure of the tuning frequency of your subwoofer or MBM, check the product page. NOTE: While the settings can be entered using the DSP controls on the front panel of the amplifier, it is much easier to update the settings using the PC software. The software is available at the Behringer website on the amplifer page by clicking on "downloads" in the upper right corner of the page. Without getting too technical, the motion of the cone will go "wild" below the tuning frequency in all ported subwoofers. This can damage the driver. In order to protect the driver, frequencies below the tuning point of the subwoofer need to be filtered out of the signal. This is accomplished with a "high pass" filter (which allows frequencies above the setting to "pass", while mostly filtering out frequencies below the setting). Note: the Dayton SA1000 amplifier comes with a protective high pass filter already in place. No additional configuration is necessary. In order to set up your high pass filter, click on the "Filter/Crossover" tab and then enter the parameters shown in the red boxes below. NX3000D (3000DSP) only requires setting the high pass on Channel A, as the high pass on Channel B won't be used. Depending on which amplifier you are running, NX3000D (3000DSP) or the NX6000D (6000DSP), there are different settings in the software on the "Configuration" tab. For the NX3000D (3000DSP), you will want to set your amp to "bridged mode". Bridged mode directs power from both channels to a single subwoofer providing significantly more output. 1. (Most common) If you will be running a single subwoofer output from your AV receiver, then choose Bi-amp1 mode (this will take a single input signal and send it to both channels on the amp). Only one cable is required and goes from the Subwoofer Output on the AVR to the Input on Channel A on your amp. 2. (Less common) If you will be running dual subwoofer outputs from your AV receiver, then choose Stereo mode (this will send a unique signal from your AVR to each subwoofer). With Stereo mode, two cables are required, one goes from the Subwoofer Output 1 on the AVR to the Input on Channel A on your amp, the other goes from Subwoofer Output 2 on the AVR to the Input on Channel B on your amp. With your protective high pass filter in place and your Configuration set up, you are now ready to plug your amp into your receiver and begin enjoying your MartySub! The design of the subwoofer and the settings work together. In a large room, typical response should be strong down to just under 20Hz. In a medium or smallish room, typical response should be strong into the mid-teens or lower. As a final step to setting up your amplifier, set the limiter to 94 volts peak, which is 1104 watts at 4 ohms. This will help protect the driver from overheating. Even with the limiter engaged, use good judgment with content (full power sine waves and similar "destructive content" are not recommended). Do I need stuffing or lining in my subwoofer? The original Marty subwoofer was designed and named by our lead designer, John (he’s the LTD02 guy), in 2013 on the AVS audio forum for a forum member named Martycool007. Since then, there have been have been hundreds of Marty sub builds and countless variations on the theme. How do MartySubs compare to sealed subwoofers that use the same driver and amp? MartySubs are large compared to most sealed subwoofers that use the same driver. The additional size provides a significant increase in low end output. 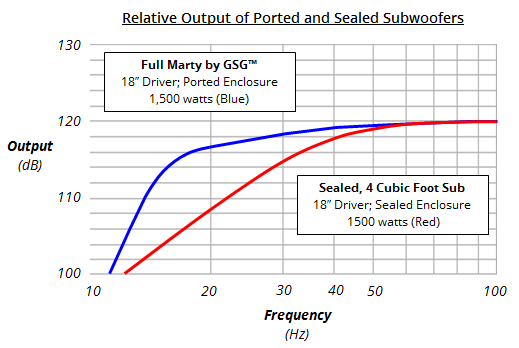 In the image below, a Full Marty is compared with a sealed subwoofer (4 cubic feet net internal volume) using the same driver (UM18) and the same amount of amp power (1,500 watts). As can be seen in the image, above 50Hz, both systems produce essentially the same amount of output. Below 50Hz, the port on the Full Marty begins to provide additional output (in much the same way as the air in a pipe organ resonates increasing its output). Of course, not everybody has the room for a MartySub, or two, or more :-), so in those cases a sealed sub or two may be the only option. Sealed subs can also have a benefit of providing some tactile response into the single digits, but their primary benefit is their more compact form factor. Where space is available, large ported subs such as the MartySubs provide the most output per dollar aka 'bang-for-the-buck'. The same rule applies for choosing a MartySub. Get the largest one that will fit in your space. Bigger models come with slightly lower tuning points and slightly more low end output. Ported subs and sealed subs can both provide an enjoyable bass experience. Discussions around "which is best" should generally be re-framed to "which is best for you", since they both have a role to play depending on the application and the goals of the user. * Technically, +10dB relative output is just over 3.16 times the output of a sealed sub. Where does the Dolby Atmos Reference Level of 125dB at 31.5Hz that you mention come from? Output from each channel is specified as 85dB + 20dB headroom, or 105dB max from each channel. What is with the trademark? I thought “Marty Subs” came from the DIY community? During an R&D process that spanned several months, extensive modifications were made to the original Marty sub concept in order to make it as easy to build and as good looking as possible in the process. We simply differentiate our line of Marty subs from all other Marty subs by designating them MartySubs by GSGTM . Folks are still free (of course) to build Marty subs as originally conceived in the DIY community and we fully support folks doing so. How do I purchase just one flat pack? UPDATE: Single and Dual flat packs are now available! MartySubs by GSG are designed using a very high grade of MDF and make use of big, beefy, bracing. As a result, they weigh in at approximately 150 lbs. While this is great for performance, it is not so good for shipping. With all the extra packaging and protection that would be required to ensure that your flat pack arrived safely (including oversize charges, excess weight fees, etc. ), the average cost to ship a single flat pack to most locations in the USA would have been around $250! What we discovered is that for not too much more than that we could ship a pallet with four subwoofers. This way the shipping cost could be spread over four subs instead of one, saving our customers a great deal of money. Then enter your location and others will be able to coordinate with you. Alternatively, you could purchase a 4-pack and then put the flat packs that you don’t need up for sale on our classified ad site. If you are near a major metro market, the chances are there are folks in your area who would love to purchase one or two flat packs from you (and you could even make a little profit for your time; pricing is completely up to each person). What is the GSG Classified Ads site? MBM is short for "mid-bass module" though we like to think of it more as "music bass module" because GSG MBM's are tuned to cover most all of the bass that is commonly found in music, even elecronic music such as EDM and dubstep. GSG MBMs are tuned to 27Hz and provide extension into the low 20's in most rooms (as compared with the Marty Sub home theater subs which are tuned from 16-20Hz and provide extension into the teens). Do I need an MBM? Many folks find that traditional, high-excursion, subwoofers lack some of the "punch" in the mid to upper bass. MBM's are designed to use pro-audio drivers which are characterized by very light moving mass (cone, voice coil, etc.). That in turns gives them very high efficiency in the mid- to upper-bass. As a result, very little power is required to achieve high SPL, which in turn minimizes compression (and other effects) and gives a perception of good "kick in the chest" bass. As an additional benefit, the bass from an MBM may sound subjectively cleaner or more articulate than that of a high-excursion driver. The downside of MBMs is that to achieve their very high efficiency, MBMs employ short voice coils which limits their output on the low end. For example, the PA460 pro-audio driver provides more mid-bass 'kick' than the UM18, but it would take THREE of them to provide the same output on the very low end (16-30Hz) as ONE UM18. Some folks have constructed subwoofer systems comprised of 6-8 high efficiency drivers in low-tuned cabinets, but that ends up being a lot of enclosures! Others have found that a combination of 2 high excursion drivers (such as UM18s) in low-tuned cabs (such as Marty Subs) combined with a 2 pro-audio drivers (such as PA460s in GSG MBM-18 cabs) achieves the best of both worlds (big strong low end as well as incredible mid-bass kick). For folks who are looking for subwoofers that will principally be used for music and occassionally for movies, MBMs by GSG can make a great choice. Because of their extreme high efficiency, MBMs don't require a huge amp to hit hard. 500 watts is all that is required for a PA460 driver. MBM's, like all ported cabs, do need a protective high pass filter. 25Hz is recommended in the case of the GSG MBM-18 cab. The following charts highlight the differences between a MBM loaded with a pro-audio driver (in this case a PA-460) and a Full Marty loaded with a big excursion driver (in this case a UM-18). The first chart shows the frequency response (with no EQ) of both systems with an arbitrary 500 watts of power. What can clearly be seen is for the same amount of "nominal power", the MBM produces significantly more output in the upper bass. 70Hz is roughly the frequency where folks report "kick-in-the-chest" bass. Additionally, each of these two systems has a different electrical impedance. The electrical impedance is caused by the natural resonant frequency created by the driver and the enclosure. The peaks respresent the frequencies where the system is highly resonant, i.e. if you thump the cone, this is likely the frequency that you will hear. The importance of the electrical impedance can be seen in how much power the amplifier is required to output at each frequency for the above example. Amplifier power requirements are inversely proportional to the electrical impedance, so the higher the impedance, the less power is required from the amplifier to produce the output at a given frequency. *Instantaneous heating in the voice coil is a cause of distortion, so the output will tend to sound subjectively cleaner as well. After all these effects are considered, the PA-460 loaded MBM is approximately 14 times more efficient at producing mid-bass than a UM-18 loaded Full Marty. That translates into a huge, real-world, difference that can be heard as well as felt. What about UM15 (15 inch) drivers instead of the 18's, will they work in MartySubs? The UM15 models very similar to the UM18. It simply has a little less max output given its slightly smaller size. With lower displaced volume, the port velocity will be slightly lower than the 18, so nothing to worry about there. We can modify the cutout for the UM15 on any of the Marty Subs without much difficulty. Send us an email with what you would like (no extra charges). The Mini-Marty is typically the best choice if the size fits in your space because it provides a couple dB more output on the very low end and has a couple Hz of additional extension. Otherwise, the Marty Cube will still provide 4-5dB more output relative to sealed in the range from just under 20Hz up to around 30Hz and a little less increase on either side of that range. 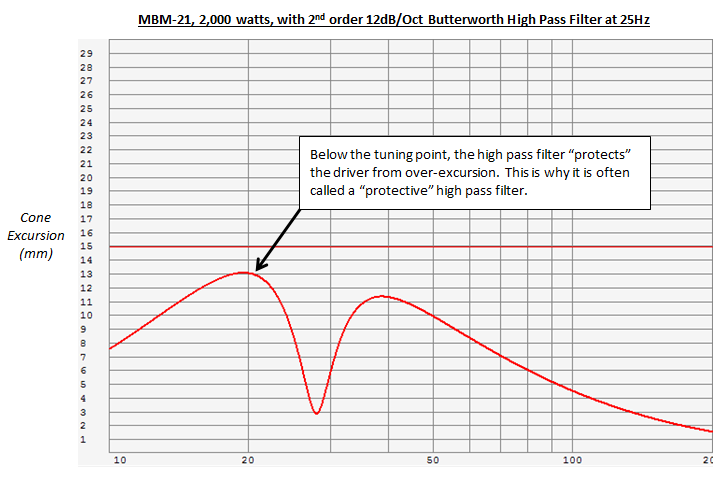 What is a high pass filter and what does it do? A high pass filter is simply that: it "filters" out frequencies below a certain point (called the crossover point) and allows frequencies higher than that point to "pass" without being filtered out. An example illustrates how it works to protect your driver. This image shows that below the tuning frequency (in this case 28Hz), the driver is no longer "loaded" by the air in the cabinet. As a result, the excursion of cone increases very rapidly. When the cone motion is too large, the driver can be damaged. This driver has very clean output when excursion is kept below about 15mm (xmax) and the damage point doesn't occur until about 30mm (which is very high for a pro-audio driver). In order to protect the driver from over-excursion a "protective" high pass filter can be applied. 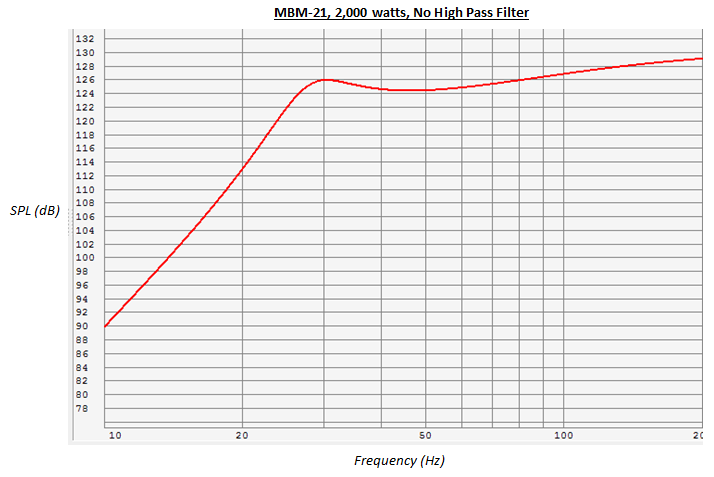 This is the frequency response with a very common protective high pass filter (2nd order Butterworth 12dB/Oct) applied at 25Hz. As can be seen in the following image, below the tuning point, the cone motion is controlled, so there is no risk of over excursion. The bottom line is all ported subwoofers behave in this fashion and so all ported subwoofers should have a protective high pass filter just below their tuning point. The result is that it will be far less likely that the driver is damaged from over excursion and because the driver excursion is controlled, the output will be much cleaner too! There are different many different kinds of filters. The two most common types are the 2nd order a.k.a. 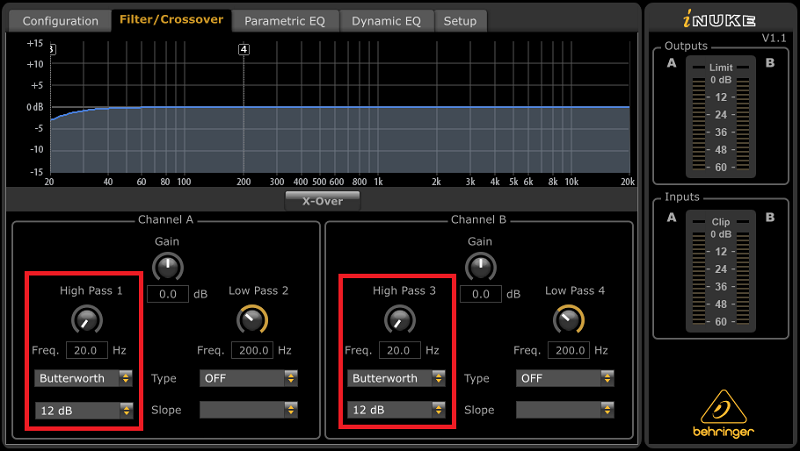 12dB per octave Butterworth and the 4th order a.k.a. 24dB per octave Linkwitz Riley. The higher the "order" the steeper the slope and the greater the rolloff. 2nd order a.k.a. 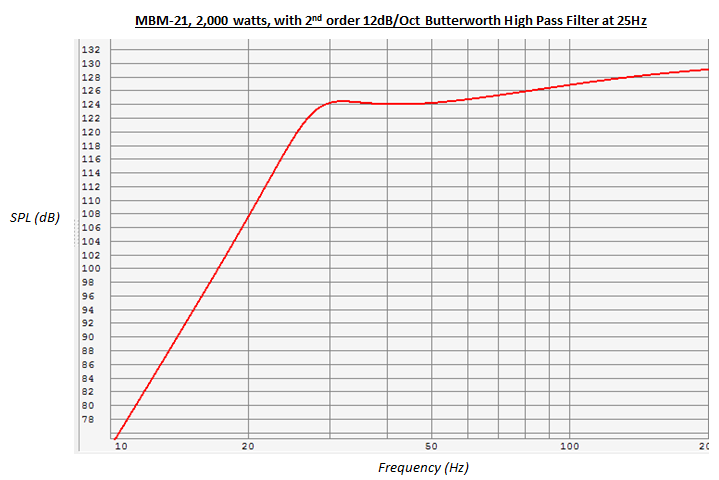 12dB per octave Butterworth is all that is needed for GSG ported subs, while 4th order a.k.a. 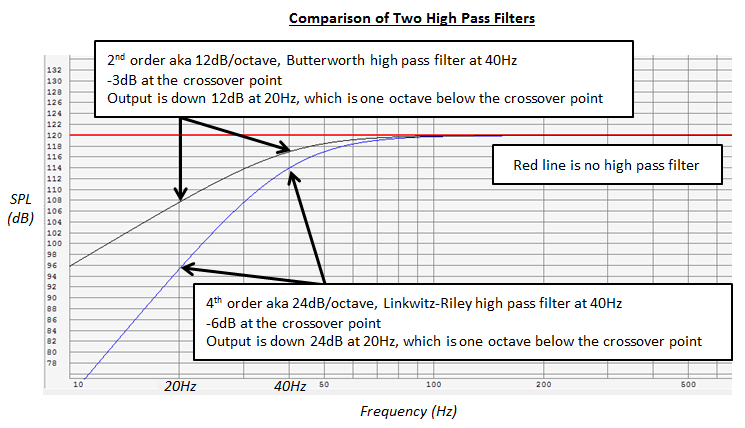 24dB per octave Linkwitz Riley is more common in speaker crossovers and/or in the crossover from the main speakers to the subwoofers. Some of our specialized products may require other types of high pass filters, but we will always let you know when this is the case! We recommend the DIY section of the AVSForum.com for general purpose and setup questions. There are many MartySub builders there sharing helpful tips and helping each other with their builds. If you have a question that you can't otherwise find an answer to, just drop us a note at customercare@gsgad.com and we'll do our best to get back to you. As you might imagine, we get a lot of questions, so sometimes it will take a little longer than we would like to get back to you. We appreciate your patience and understanding.